Flower size: clustered on spikes of 4"-10"
Flowering/fruiting time Fl. early May to early June; fr: early June to early July. Range in New Jersey: A few stations in northern counties, but mainly a plant of the coastal plain and Middle district, though often found in the Pine Barrens and Cape May district. Misc. : Leaves divided into 7-11 finy, hairy leaflets, wheel-like. 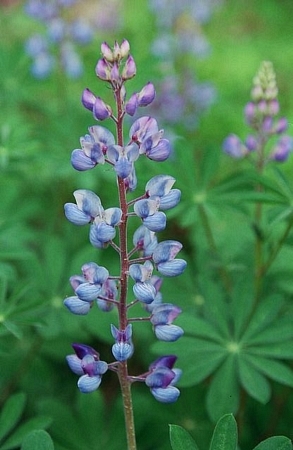 In Demographic and genetic factors affecting population viability of Lupinus perennis, an indicator species of Oak Savanna., Mitchell and Michaels note that "small and sparse populations often have low reproductive success, indicating that fragmentation of populations by human activities may prevent populations from being self-sustaining.". 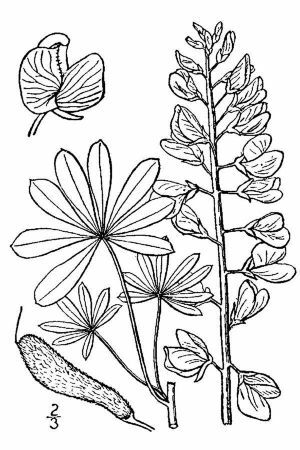 Lupinus perennis is the larval host plant for both Karner Blue butterfly (Lycaeides melissa sub. samuelis) Frosted Elfin butterfly (Callophrys irus) . The plant was once thought to deplete or "wolf" the mineral content of the soil; hence the genus name derived from the Latin lupus ("wolf"). Actually the plant and all the family enhances soil fertility by fixing atmospheric nitrogen into a useful form.